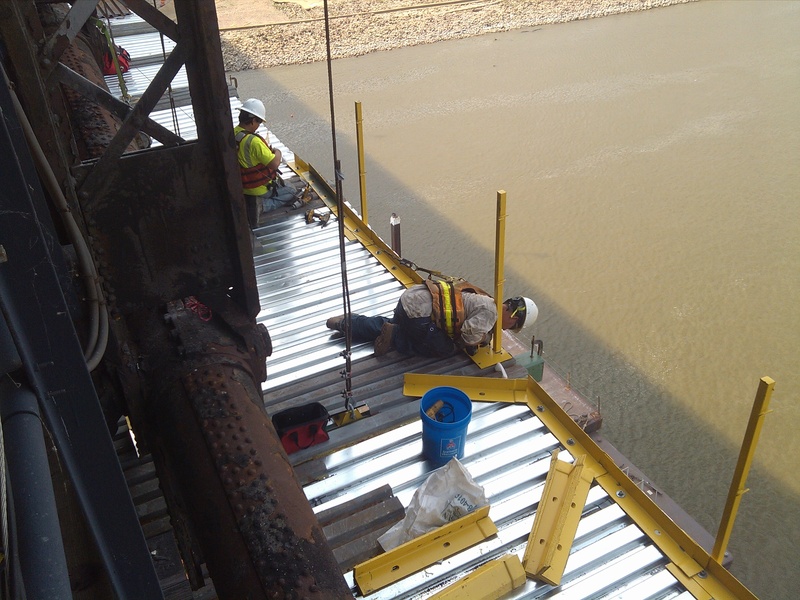 As the new year arrives, you will start to see more construction activities on the historic Eads Bridge rail deck. If you travel back and forth over the bridge on MetroLink, you may have noticed workers installing scaffolding during the past few months. The scaffolding will provide a platform from which tradesmen who are restoring the historic landmark can safely work. It is dangerous work and Metro’s design engineering firm– TranSystems and our contractor– St. Louis Bridge Construction Company and its subcontractors are up for the challenge. It is certainly not a place for those whose are afraid of heights or of working above a treacherous river– regardless of temperatures, wind or weather conditions. The Eads Bridge was the first bridge to span the Mississippi River in the St. Louis area and first major bridge to employ the use of steel as the primary structural element. It was considered an engineering marvel at the time and engineers and tradesmen alike continue to marvel at the complexity and innovation inherent to the structure. Ask anyone who has spent any time on the bridge and they will tell you they see something new out on the bridge every time they walk out there. For example, some of the pins holding together iron and steel pieces which were most likely used when the bridge was erected are not like anything you would find fabricated today. Metro and the crews are not sure what they will find once they get down to the bare metal, after as many as nine layers of paint and rust are removed. 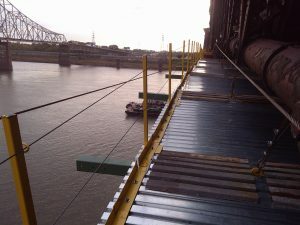 They already know that virtually no two sections or pieces of the bridge are the same measurement. It is a very unique bridge and a very unique and exciting project. At the bridge dedication in 1874, bridge designer James Eads said the bridge would endure “just so long as it continues to be useful to the people that come after us.” That’s according to the Missouri Historical Society book The Eads Bridge text by Howard Miller. Not only is the bridge still useful 138 years later, it is the only way for MetroLink trains to cross the Mississippi River between Missouri and Illinois. 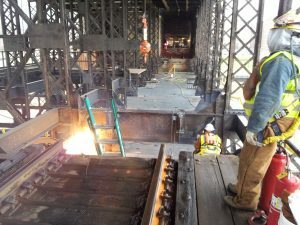 It is important for Metro to refurbish the bridge structure and rail deck so they are in good shape for future generations and will continue to be a vital link connecting bi-state residents to jobs, entertainment venues, and other important destinations. 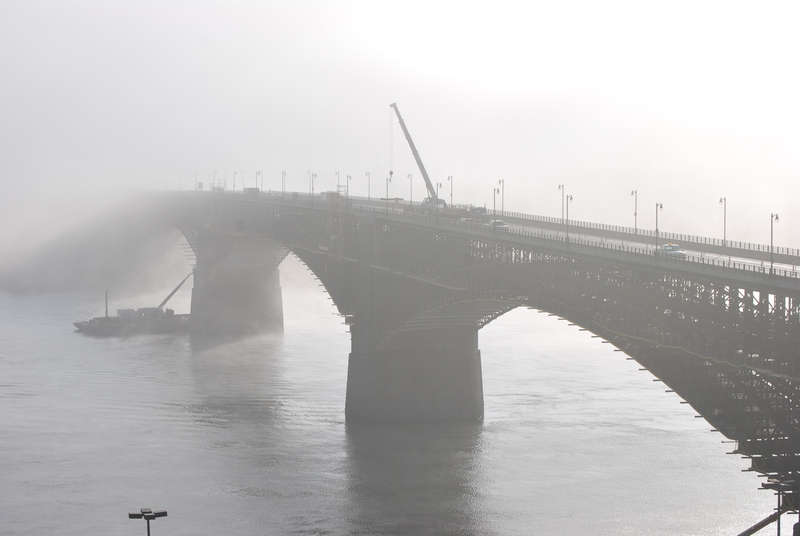 The current project is expected to add another 50 years to the life of the Eads Bridge. The scaffolding will also serve as the base for the containment system which will encase one section of the bridge at a time. You will start to see the containment walls going up early next year. It will be a cocoon of sorts that will catch the dust and debris so it cannot be released into the air or fall into the river and impact the water quality. Layers and layers of old paint and rust will be blasted off the steel structure. Sections will be replaced, as needed, before the new rust inhibiting primer and paint will be applied. Special precautions will be taken inside the containment area for the health and safety of those workers. 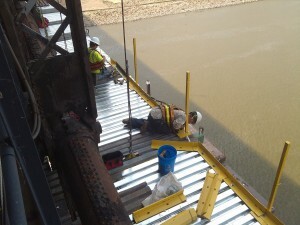 We hope to give you a sneak peek and provide some insight into the work inside the containment area in a future blog. For the first part of the project, the work will focus on the north side of the bridge which contains the westbound tracks. That’s why for some time now, westbound MetroLink trains have been getting across the bridge by sharing the eastbound tracks and then are switched back onto the westbound tracks at each end of the bridge. This allows MetroLink trains to operate as normal while allowing crews to work on the westbound tracks. 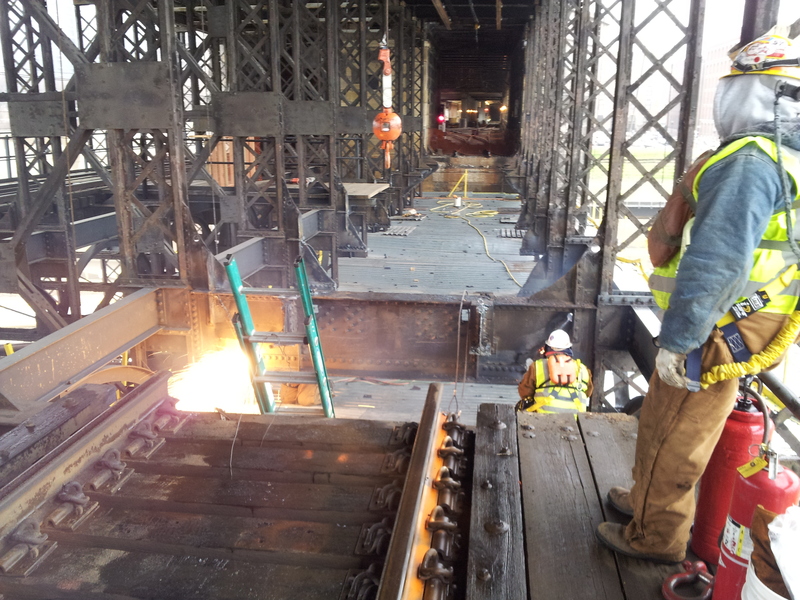 The westbound rails will be demolished and removed during the work and then a new track floor system will be installed before the work then moves over to the south side of the bridge in 2014. If all goes as planned and there aren’t any major surprises, the work on the eastbound side of the bridge should be completed in the fall of 2015.